Today, MyShingle profiles Nicole Schaefer of Let’s Untie the Knot, another innovative legal option for family law. (We previously profiled Erin Levine of Hello Divorce , and I wrote about It’s Over Easy at Above the Law ). Here’s the thing: family law is a huge space with thousands of clients searching for affordable and convenient options. In short, the market space is wide open, so why not dive in? What is your name, company and years in practice. My name is Nicole Schaefer and I’ve practiced law for three years. My business is Let’s Untie the Knot. Tell our readers about Let’s Untie the Knot – what is it? but not everything, or who would rather purchase services separately instead of purchasing a package. In addition, we have a great online platform, where spouses can chat and settle their case—and we have a group of professionals standing by in case an uncontested divorce becomes contested. What made you decide to start Let’s Untie the Knot? make the process easier and more accessible when I was told about a website in California that offered online divorces. I decided to create something similar for Oregon residents. 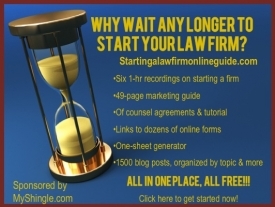 Is Let’s Untie the Knot structured as a law firm that offers advice? A non-law firm that supplies pro se materials and legal information? Or something else? lawyer without the actual lawyer. I think this is where law is heading, and I think people want more independence. Just in case they need help though, we’re here, too. What kinds of services does Let’s Untie the Knot provide? services and subscriptions soon. So, for example, if people just want access to a ton of helpful articles and resources, they can just do that. If they want a Petition and nothing else, that’s okay, too. How did you design the website for Let’s Untie the Knot? Did you work with a technical team? Tell us a little about the development process. can add the new services I want and make the site more versatile. The development process has taken awhile, but I think it’s been relatively painless for all involved. Many people – in particular attorneys – often deride self-help resources, saying that “you get what you pay for?” How would you respond to those sentiments, and what have you done to ensure that Untie the Knot’s customers will be competently represented? Well, that’s basically why I created this website. I used to work at a firm where we told our clients that divorce paperwork was designed by lawyers for lawyers and that the divorce process was not made for the Average Joe. I think there is a lot of truth to those statements and often when people do these things themselves, there is a lot of room for error. I wanted to create a self-help website where people were getting the information they would have to go to a lawyer to get, so they actually understand the entire process and the documents they are having created for them. I never understood the need to make this process so complicated and so inaccessible to those without a law degree. What is your five year plan for your new site? Do you hope to expand it nationally at some point? For now, obviously, we are focused on Oregon and Washington (I’m applying for reciprocity). I definitely plan to make it nationwide eventually. I think this website has unlimited potential. I’m excited to see what happens. What advice do you have for readers who have an innovative idea for their law practice or a related business but don’t know where to start. I would just say, don’t hold yourself back. I think law, in particular, is a field where people are scared of innovation and change. The problem for me as a lawyer is that my brain is innately creative, and so I am coming up with new ideas constantly. Nobody thought I would be a lawyer. Seriously. I feel like I needed to do something like this because traditional legal work would have burned me out at some point. I also think that the world is heading in a direction where more and more of these legal services will be online. I’m already noticing a rise in virtual firms around the U.S. There’s a reason for that. I think if lawyers don’t adapt, our profession will go extinct. So, for people wanting to do these innovative things: go for it. Ignore people who tell you you can’t or shouldn’t. The possibilities are limitless. As for practical advice, I would say if you come up with an idea and want to create something like this, the absolute best thing you can do is surround yourself with amazing talented people to help you. Don’t try to do everything yourself. It won’t work. Hire a developer, a social media person, a PR person, whatever. Don’t be afraid to delegate. Also, someone told me, “If you pay peanuts, you’ll attract monkeys.” Basically, get the best people to help you. It’s more expensive, but it’s worth, it in the end. Finally, don’t be afraid to change something if it isn’t working. That’s the best quality an entrepreneur can have, in my opinion. The ability to adapt quickly.